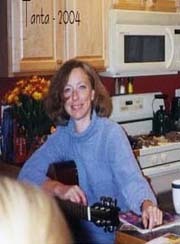 The U.S. Census Bureau announced today that advance estimates of U.S. retail and food services sales for October, adjusted for seasonal variation and holiday and trading-day differences, but not for price changes, were $363.7 billion, a decrease of 2.8 percent from the previous month and 4.1 percent below October 2007. Total sales for the August through October 2008 period were down 1.3 percent from the same period a year ago. Retail trade sales were down 3.1 percent from September 2008 and were 5.0 percent below last year. To calculate the real change, the monthly PCE price index from the BEA was used (October PCE prices were estimated based on the increases for the last 3 months). Although the Census Bureau reported that nominal retail sales decreased 5.0% year-over-year (retail and food services decreased 4.1%), real retail sales declined by 8.8% (on a YoY basis). This is the largest YoY decline since the Census Bureau started keeping data. 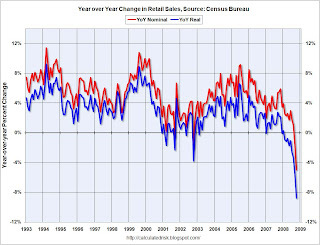 Retail sales are a key portion of consumer spending and real retail sales have fallen off a cliff.